First of all: I live in Korea! WOAH! That pill has been swallowed, and – while bittersweet – the lump is starting to dissolve and we are slowly integrating into our new surroundings. Here is one of the experience I feel worth documenting as my first “In Korea” blog post. Between 0730-0800 is one of my new favorite times of day. 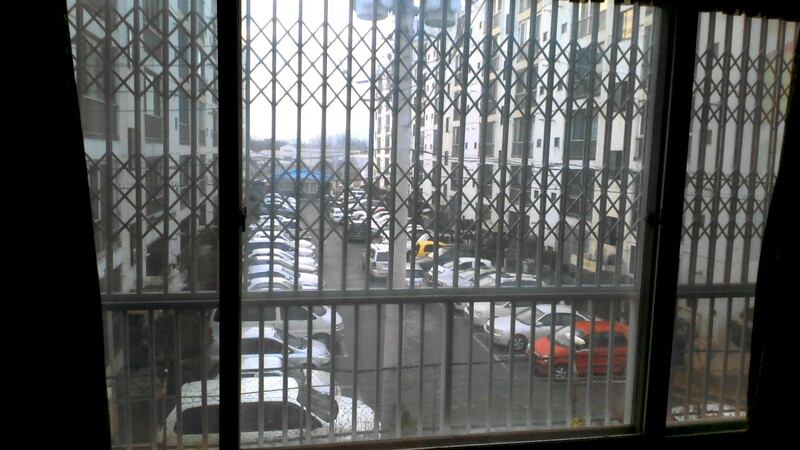 Here in our new home, our livingroom window faces the parking lot of an apartment complex. It is a little hard to see, thanks to the window fence and power pole. (Click it, make it bigger!) There are some cars that are parked blocking other cars into their parking spaces. This, of course, is because there are not enough spots for everyone that lives there. I have never seen anything like this before. Where I come from, if you blocked a car in, you’d have half the neighborhood having their doors banged down until someone finds you to over your car. In Korea, they park it in neutral and whoever is blocked in just moves the car forward/backward so they are no longer blocked. This leads to a pretty entertaining morning as everyone seems to be leaving for school/work at the same time! Also, check out the small distance left between the cars parked in the middle. Not a lot of room to pull out of your space and be able to turn and drive out, right? They can take what would be a 15-point turn around and knock it out in 3 or less! Something I have noticed in my Parking Wars watching is that Koreans are excellent at backing up their cars. They may not have a positive reputation for many things when it comes to vehicle operation, but I’ve got to give it to them – these people can reverse like it’s going out of style! Just want to be sure that I am a member of this Blog and can keep up with my adoptive family! Enjoyed the blog, very interesting. Hang in there. Wow! Who’d have thought? Very interesting….. if you hadn’t been the one to tell me, I wouldn’t have believed it! Loved your first effort . . . . look forward to many more! Love to you three!